DETAILS: A watercolor portrait where we won't need to paint you a picture! This newly constructed Watercolor carriage house is tucked away with the state forestlands in your backyard and a short walk/bike ride to Watercolor's pools, lake and gulf. This beautifully appointed one bedroom let's you take in all that Watercolor has to offer: part home, part destination resort – the best of both worlds. At the end of your picture-perfect day? A peaceful stroll home and relax to indulgences that include a full kitchen & washer/dryer. 3 night minimum in season. The home offers 1 parking space. love love love this little nook in the treetops. quiet and quite spacious for a one bedroom. clean and cozy. the owner happened to be in the main house....an extra plus. We are so glad that you enjoyed your vacation with us in Watercolor! We agree that this home is perfect for a quiet and relaxing beach getaway! Thank you for staying with 360 Blue, we hope to see you again soon! We had a fabulous mother-daughter weekend in this carriage house! It had everything we needed and we hardly moved the car. We rode the bikes to the beach, pool, and even Red Bar for dinner. The bed was very comfortable and the cul-de-sac assured a quiet, peaceful stay! We are so glad that you enjoyed your vacation with us in Watercolor! We agree that this carriage house is a wonderful option for a fun-filled vacation and the house bikes are a great perk to the property! We look forward to seeing you again very soon! This cottage was the perfect place to stay. Backs up to beautiful woods but just down the road from the beach. My family loved it and we will definitely be back! We are so delighted that you and your family enjoyed your stay with us in Watercolor! We agree that this location is a wonderful option for a relaxing beach getaway. We look forward to hosting you all again soon! We had a great stay here. We were concerned it wouldn't be spacious enough, but it was. The finishes are nice, the location is peaceful, and the host was welcoming. We loved riding the included bikes to the beach and to explore the area. We can't wait to come back to Watercolor and explore 30a more. We loved it. We are so delighted that you and your family had such a wonderful time with us in Watercolor! We agree that this home is a perfect size and sits in a great location to enjoy everything Watercolor has to offer! We especially loved the photo you shared, it's adorable! We hope to see you all again very soon! Love the location. The owner was super nice. Best carriage house we stayed in on 30A. We are so glad that you enjoyed your stay and we love the photo you shared with us! 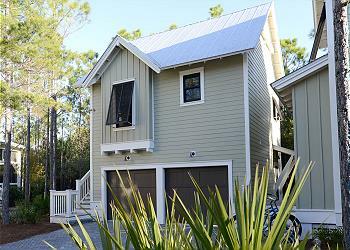 We agree that this carriage house is a wonderful option for a carefree beach getaway! We hope to see you again very soon! We had a great time in this cute cottage house. It was the perfect size for us. 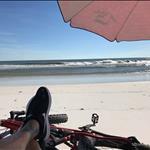 Just a short bicycle ride to the beach or pool. Easy ride to Seaside as well! We are beyond thrilled that you and your family had a wonderful vacation! The family photo you shared is beautiful! We agree that this home is the perfect fit for a close family and is in a perfect spot to enjoy a fun and relaxing beach getaway. We look forward to seeing you again very soon! We had trouble getting your app and we didn’t receive checkout info until this evening. We told reservations that we could only stay 2 nights but went ahead and paid for 3 since that was a required stay time. I also told Christine that we had to leave today and she was able to let us check in a few hours early which we really appreciated. I did load the dishwasher but did not start it because we had no check out info. We did turn out all lights and lock doors. We thoroughly enjoyed our stay at 166 Sandy Creek Drive. We are so happy to hear that you enjoyed your stay in this beautiful home. Please do not worry about the check out items, our team is happy to take care of them. We loved having you with us and hope to see you back soon! Wonderful cottage at 166 Sandy Creek. Perfect, perfect. We will be back. We are so happy to hear that you enjoyed your stay in this incredible home. We hope to see you back at the beach soon! What a great find....quiet area but close to everything. Spend all day at the beach and pools with the other tourists and then come home to quiet. Decorating and vibe felt perfect. Love the full kitchen and easy access to the state park right out the door. Will definitely bookmark this place next time we’re back. Thanks 360. We are so happy that you enjoyed your winter getaway in this beautiful home. It sounds like you had the perfect mix of fun and relaxation. We loved having you with us and hope to see you back at the beach soon! cozy and roomy...all in one. always like coming back to this wonderful respite. out the back door to grayton state park is a plus. What a beautiful picture of the sunset! We agree that this amazing home is both cozy and roomy, making it the most wonderful choice for your Watercolor vacation. 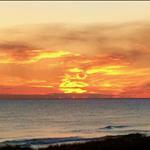 The location can’t be beat, as the state park and the beach are both easily accessible from the home. Please come back and stay with us again soon!